Want to ride into town, or to the start of a trip by public transport? Our low-cost Cycle Hubs and bike lockers across the region mean you can leave your bike without worry. 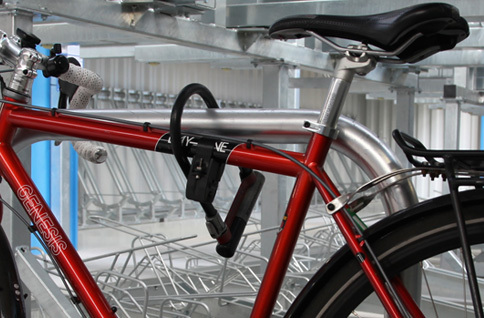 A Cycle Hub is a safe and secure place to lock your bike under cover, away from potential thieves. 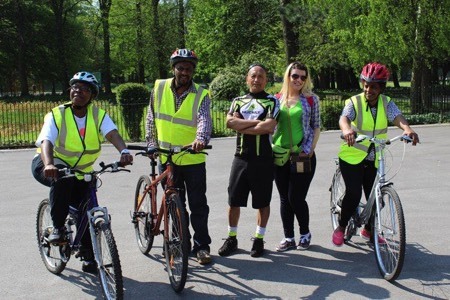 Protected by CCTV and a swipe-card entry systems, there are Cycle Hubs near public transport links and other convenient places across Greater Manchester. Find out about membership and how to use one of the hubs. Registering and purchasing Cycle Hub membership is quick and easy. There are hundreds of dedicated bike parking places across Greater Manchester. They are free, but not as a secure as a Hub or locker. 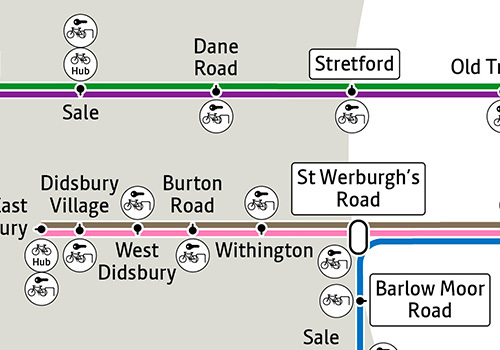 Look for the blue 'P' symbols on our online cycle map. Cycle parking is available at most tram stops. 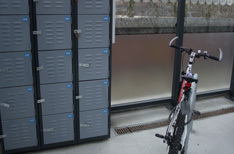 Join the Bike Lockers Users' Club (BLUC) to use any of the hundreds of lockers at rail stations, bus and tram stops across the region. It costs £10 to join BLUC either by calling 0161 244 1000 or downloading and completing the form below. 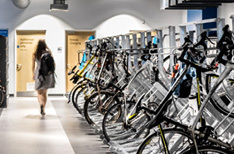 When you have joined the Bike Lockers Users Club (BLUC), you will be sent a padlock key - which will open any of the TfGM bike lockers at rail stations, bus and tram stops all across the region. For more information on Membership, getting in, problems and cancellations - follow the link below. 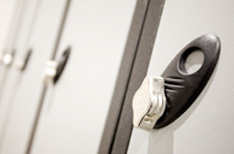 Our Hubs and lockers are great ways to keep your bike safe while you're out and about. But you should always keep your bike as secure as possible, especially if you're parking on the street. There are several steps you can take to secure your bike and minimise the risk of it being stolen or damaged by an attempted theft. Buy the best bike lock you can afford: good ones are graded 'bronze', 'silver', or 'gold' depending on how long it would take a thief to break through it and gain access to your bicycle. Two locks are better than one; you can put one through the frame and one through the wheels (you can take the front wheel off and lock it to the back wheel). If you're parking on the street, choose a busy, well-lit place - preferably with CCTV coverage. See more about bike security at the British Cycling website.